After years of lobbying by OOSS, CMS has agreed, for the period 2019-2023, to update ASC payment rates by the Hospital Market Basket rather than the lower Consumer Price Index-Urban. OOSS has been a leader in the effort to effectuate this change for over twenty years, seeking to persuade both CMS and Congress of its merits. Under this new policy, ASCs would receive the same update as hospitals, subject to certain adjustments. Under the new policy, ASC payment rates would be updated by 2.1 percent in 2019. Please note that this is an average and that updates will vary by code and specialty. CMS has finalized its proposal to define ASC-intensive procedures as those services with a device offset percentage greater than 30 percent, in contrast with the current threshold of 40 percent. This policy will expand the services eligible for additional device-related payments. In a “clean up” of outdated or unnecessary quality reporting measures, CMS in the final rule has removed two measures for reporting, including ASC-8, Influenza Vaccination Coverage Among Healthcare Personnel. CMS did not follow through on its proposal to remove ASC-1, Patient Burn; ASC-2, Patient Fall; ASC-3, Wrong Site, Wrong Side, Wrong Patient, Wrong procedure, Wrong Implant; ASC-4, All-Cause Hospital Transfer/Admission. However, data collection will be suspended until further action is taken by the agency to revise these measures. 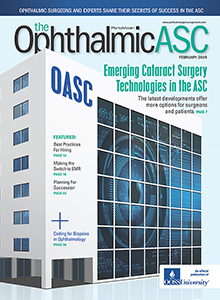 ASC-11, Cataracts—Improvement in Patient’s Visual Function within 90 Days Following Cataract Surgery will remain in the ASC Quality Reporting Program; however, reporting on ASC-11 will continue to be voluntary. CMS also made changes to the factors used to remove measures from the ASC Quality Reporting Program so as to better align these factors with that of the Hospital Quality Reporting Program. CMS has finalized its proposal to separately pay for non-opioid pain management drugs that function as a supply when used in a surgical procedure furnished in an ASC. At this time, HCPCS code C9290, Exparel, is the only drug that qualifies; however, CMS acknowledges that other drugs might meet these criteria in the future. Should you have any questions or concerns, please contact OOSS Washington Counsel, Michael A. Romansky, JD, at mromansky@OOSS.org.